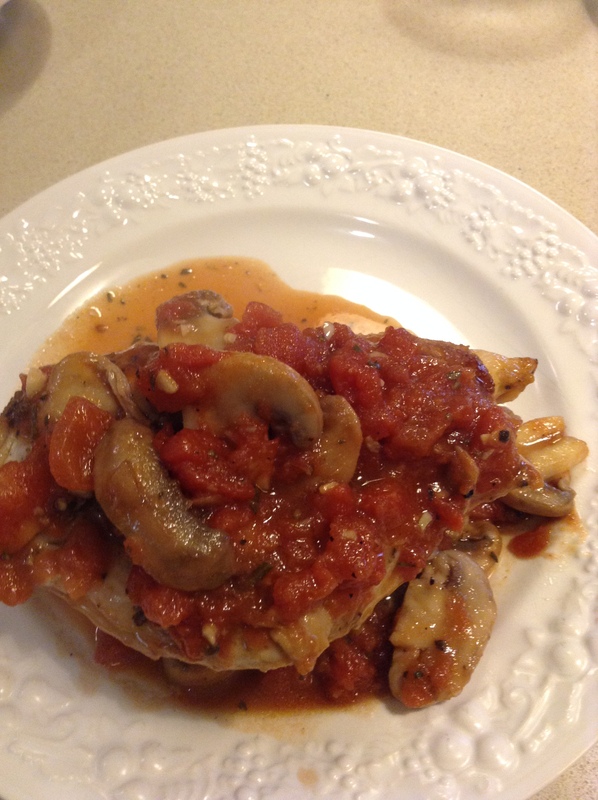 My original post on Chicken Cacciatore is very delicious but has one ingredient that I needed to leave out for tonight’s dinner and that ingredient was flour. 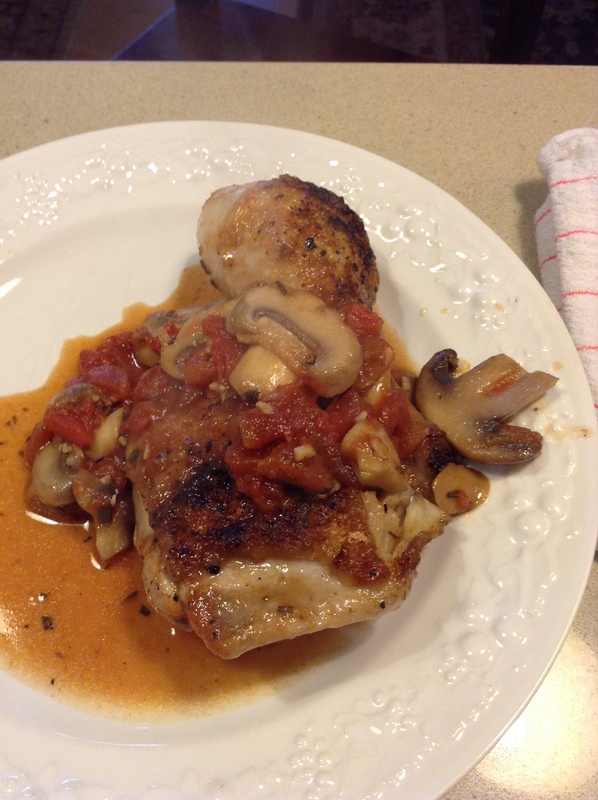 I also changed recipe a little bit from my original which was posted on January 24, 2013. While the original post is really a great recipe this one was super easy , a few less ingredients and super fast. I must admit it was lighter because of the omission of the flour and that one step does take a lot more time. I also used a whole chicken cut up in parts because that’s what I bought. My other recipe is just thighs which of course you can use as well. Any chicken parts will work . If you’re looking for a new chicken recipe this one could be it. We both enjoyed and it would be awesome with some rice on the side and a green salad. Put pot on stove ( I used my Le Creuset dutch oven) turn heat on stove to medium high. Add the olive oil and heat until it shimmers ( 1 minute) Using tongs add chicken to hot oil in a single layer skin side down. Cook until skin is a deep golden brown. 10 – 12 minutes. Once the chicken skin is browned , flip it over and cook for maybe 3 more minutes on other side. Chicken should release easily from the bottom of the pan. ( use cooking spray) when chicken is finished cooking , transfer to a plate ( I place a paper towel on plate to absorb any extra oil) Turn off heat. Wipe off any dirt from mushrooms, then either slice or cut mushrooms into quarters. You’ll want to remove the ends of mushrooms. Re-heat the oil being careful not to burn the oil. Once oil is hot enough add mushrooms and garlic into the pot. Cook a few minutes. Then add the white wine and using a wooden spoon, scrape up any brown bits from the bottom of the pot. Bring to a low boil and cook until the wine has almost evaporated, about 6-8 minutes. Add the tomatoes, rosemary, and the remaining 1/2 teaspoon kosher salt and 1/4 teaspoon of freshly ground black pepper. Let it come to a boil. Nestle the chicken into the sauce. Transfer the pot to the oven and roast for 25 minutes. 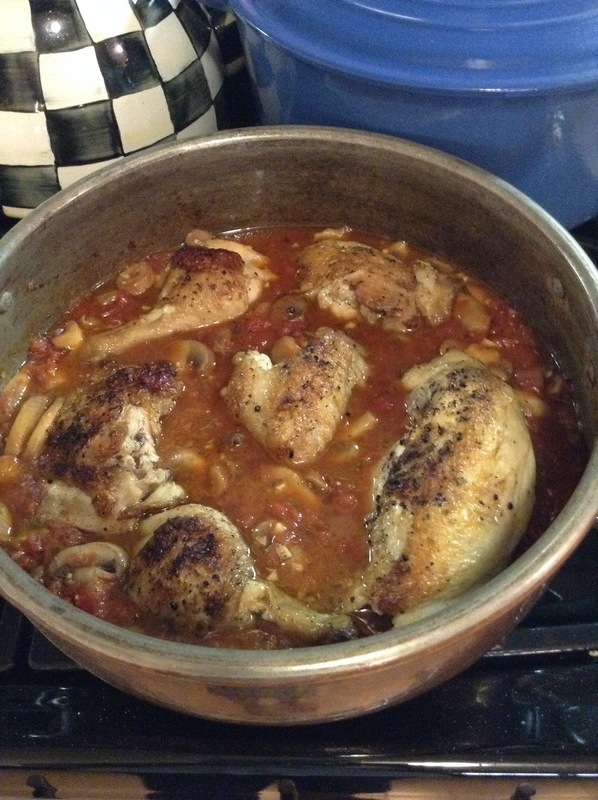 *You’ll need a heavy dutch oven for this dish so you can cook it on stove-top and put in the oven. I love my Le-Crueset pot for cooking meals like this. 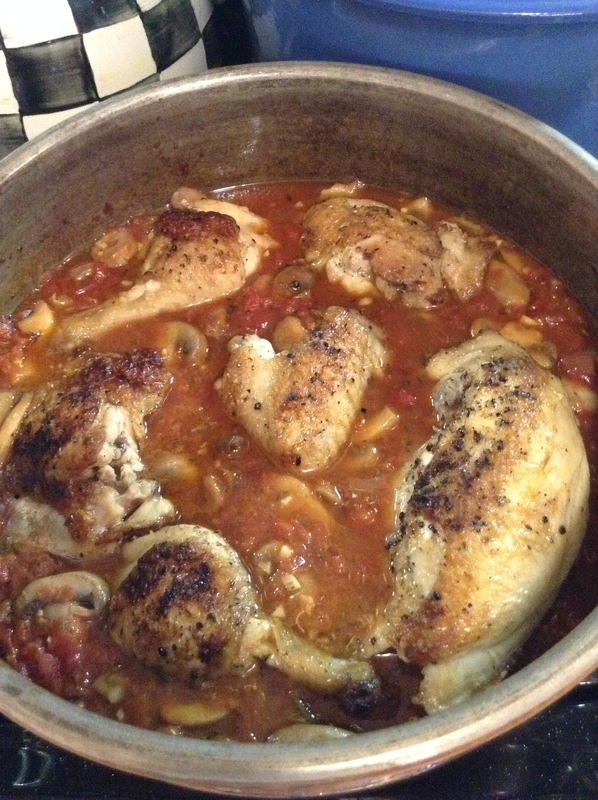 This entry was posted in chicken, chicken and tomatoes, Cooking, stew and tagged Chicken, Chicken Cacciatore, one pot cooking. Bookmark the permalink.